How many pieces of wood in a violin? What's the most expensive opera costume of all time? Which orchestra was booked to sail on the Titanic? Discover these random, bizarre and thoroughly interesting facts from the world of classical music. 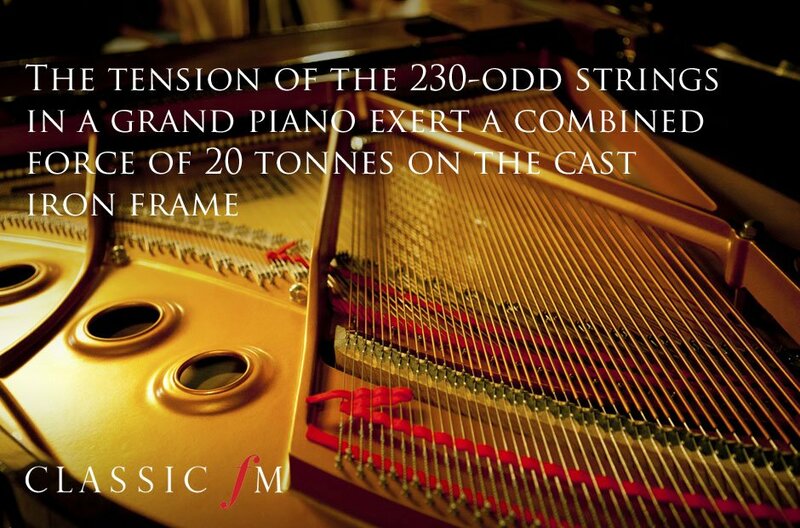 The tension of the 230-odd strings in a grand piano exert a combined force of 20 tonnes on the cast iron frame. Robert Schumann would often plunge his hands into the entrails of a slaughtered animal to heal his ailments. There are two skulls in Haydn’s tomb. His head was stolen by phrenologists and a replacement skull was put in his tomb. In 1954, the real skull was restored but the substitute was not removed. Rossini wrote the aria ‘Di tanti palpiti’ while waiting for some risotto in a Venice restaurant. A single violin is made from over 70 individual pieces of wood. According to his boasts, Don Giovanni seduced 1001 Spanish, 640 Italian, 231 German, 100 French, and 91 Turkish women. The London Symphony Orchestra was booked to travel on the Titanic's maiden voyage, but they changed boats at the last minute. Baritone Leonard Warren died on stage at The Met in 1960 just as he had finished singing Verdi's 'Morir, Tremenda Cosi' ('To Die, a Momentous Thing'). Dogfish skin was often used in the 18th century to sand violins. Soprano Dame Nellie Melba died from a skin infection after an unsuccessful facelift operation. Russian cosmonaut Yuri Gagarin sang a Shostakovich song, 'My Homeland Hears', over the radio on his first space mission. During a performance of Boris Godunov at Sydney Opera House, a chicken fell off the stage and onto a cellist. Renaissance composer Orlando de Lassus was kidnapped many times as a boy because of his beautiful singing voice. The most expensive opera costume of all time was worn by Adelina Patti at Covent Garden in 1895. It was worth £15 million. Franz Liszt received so many requests for locks of his hair that he bought a dog and sent fur clippings instead. When he died, conductor Herbert von Karajan's wife, Eliette, inherited a fortune worth €250 million. 'Mozartkugeln' is one of the most popular chocolate brands in Austria. Havergal Brian's Symphony No. 1, the 'Gothic', requires over 800 musicians to perform, including 82 string players. Domenico Scarlatti composed his 'cat fugue' after his cat, Pulcinella, walked across his keyboard. The Japanese word 'karaoke' comes from a phrase meaning 'empty orchestra'.